Mystery solved!! I'd always wondered what that white build up was on the soil of my house plants, and now I know! It's soluble salts: minerals or fertilizers that are dissolved in water, and are left behind to accumulate after normal evaporation of water. I used to just take a spoon and mix them back into the soil... oops (don't do that!!). Instead you should scoop the whitish and yellowish film off the top of the soil and discard it. Soluble salts that are present in the soil in concentrations that are too high can damage the plant. Salts form a yellow or white crust at the top of the soil or at the bottom at the drainage holes. They can cause salt toxicity, which can result in reduced growth, brown leaf tips, leaf dropping, wilting, root damage, root rot, reduced water absorption capacity. 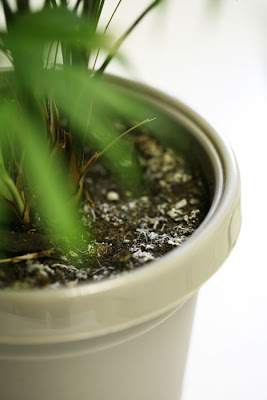 Prevention: when you water, allow the water to run through soil and drip out of the bottom of the pot, but do not let the plant sit in that water. Empty and clean the drip tray (the salts will be reabsorbed back into the plant if it is allowed to soak up previously dripped water). Every few months, plants should be leached: pour a lot of water on the soil and let it drain completely. Remove any salt crust layer at the top BEFORE leaching so that this salt is not reintroduced to the soil. Salt toxicity happens in house plants because of the low light conditions: lower light results in lower water requirements for the plant, which reduces the opportunity for the excess salt to be leached away or diluted. You can also just wash these salts away, using rainwater. We lost several plants during our drought this past summer because we have a lot of salts in our 'city water'. No rain to wash them out, our plants died. Bummer. That makes sense! I wonder if watering them with bottled water in lieu of rain water would help. We buy Canadian Springs, which according to their label is "demineralized by reverse osmosis". Hmmm. Our cats definitely prefer it to tap water, which says something... maybe I'll try it on the plants too.